These days, our lives are increasingly busy, and in many homes both partners work. Our schedules make it difficult to find the time or the energy for housework. 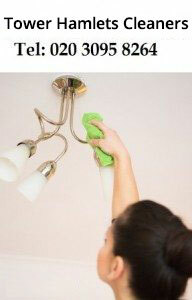 At Tower Hamlets Cleaners we offer a wide range of house cleaning services, ranging from one off to daily cleaning. Our professional and highly experienced domestic cleaners will make it possible for you to enjoy the free time that you do have. Excellent Domestic Cleaners Only For You – Book Now! Our current home cleaning services are used by tenants, homeowners and landlords as we offer daily cleaning, weekly cleaning, end of tenancy cleaning and spring or deep cleaning. The individual cleaning services we offer are numerous but they include vacuuming, cleaning of skirting-boards, the removal of cobwebs, emptying and cleaning of bins, cleaning or wiping light switches and fittings, washing of window interior glass and window sills, dusting of lampshades and other light fittings, wiping down doors and door frames, cleaning the bath or shower, the removal of lime scale from showers and bathroom tiles, thorough cleaning of toilets, cleaning of bathroom washbasins, cleaning of cookers inside and out, wiping down of kitchen cupboards and doors, cleaning of kitchen work surfaces and appliances, vacuuming and mopping kitchen floors. With a deep clean, further options include: cleaning and defrosting fridges and freezers, cleaning inside kitchen cupboards, sanitising all surfaces and floors, and cleaning and descaling sinks and taps. If you are unable to be at your home at the time we are scheduled to arrive to do the cleaning, we offer a key drop off and collection service for a small additional fee. You can discuss in details all that you want to know regarding our professional cleaners and our economical cleaning prices. Call us today on 020 3322 7907.